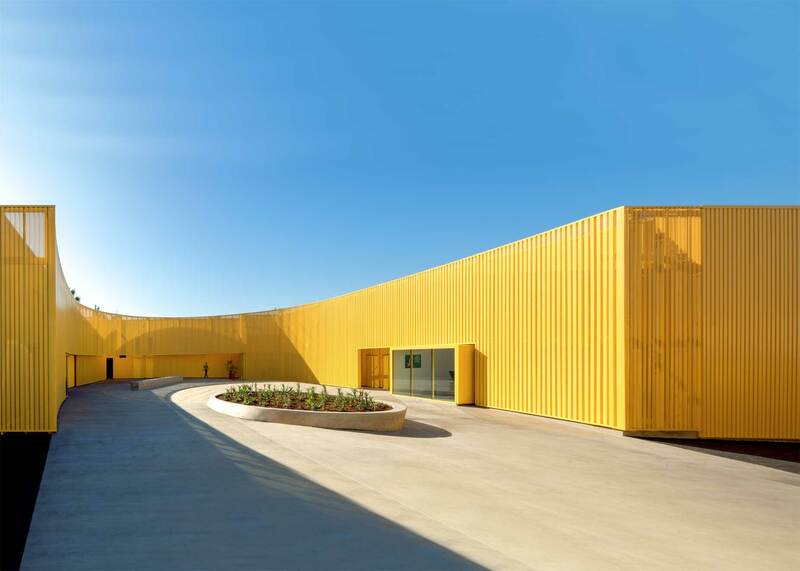 The American Institute of Architects Los Angeles chapter (AIA|LA) has announced its annual design awards winners for 2018, highlighting the work of many of the region's most creative and thoughtful architecture practices. 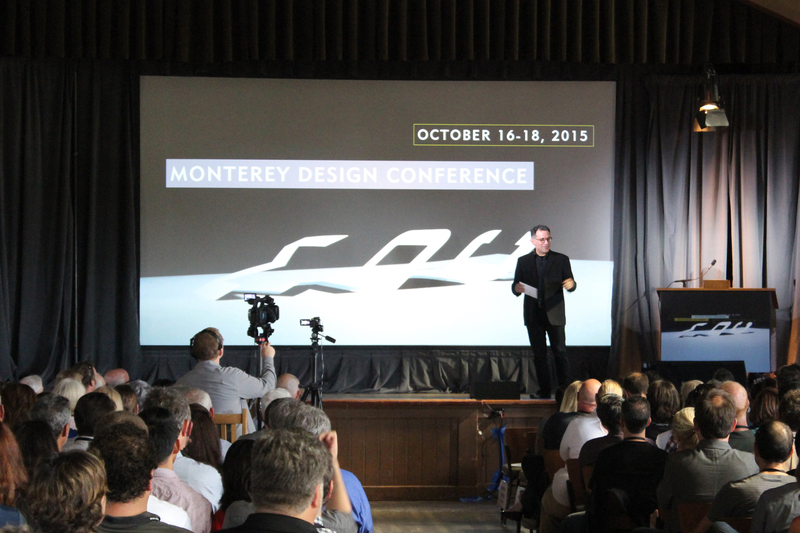 Awarded across three categories—Design, Next LA, and Committee on the Environment (COTE) LA—the organization's award program is designed to recognize achievements in overall design, highlight the work by emerging designers, and bring attention to hallmark sustainability-focused projects. Within each category, awards are ranked into "honor," "merit," and "citation" rankings. Google has been on an expansion tear lately, and has announced plans to follow their recently approved Mountain View, California housing development with a new campus in neighboring Sunnyvale. The one-million-square-foot project will be called Caribbean, and sees Google teaming up with Bjarke Ingels Group (BIG) yet again for a pair of terraced office buildings for up to 4,500 employees. The city of Sunnyvale is no stranger to Google, as the tech giant has been consolidating land purchases throughout the year and most recently paid $21 million for a five-acre plot in the Moffet Park area on December 22nd. 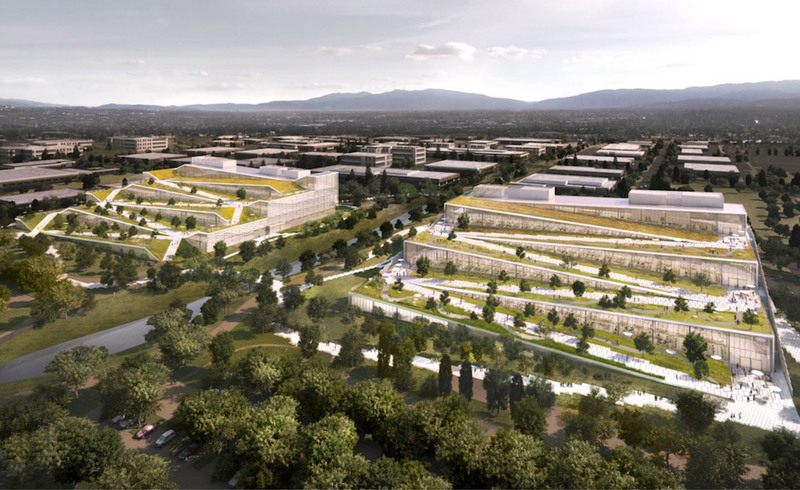 BIG and Google are also familiar partners, as the firm has been involved with both the Charleston East campus and speculative designs for the northern Mountain View residential project. Their latest collaboration will involve two five-story office buildings, each featuring green roofs with paths that gently zigzag atop stepped floors. Each building will connect these paths with the ground level and encourage the building’s melding with the street. Renderings show that these paths could be used for a variety of activities, from biking to skating, and that any floor of each building should be accessible from outside. Although each office building will be clad in a floor-to-ceiling glass curtain wall, they differ slightly in their typology. While one is boxier, with easily distinguishable steps and clearly defined plazas and gathering areas, the other resembles a cascading hillscape with organically defined curves and valleys. From the ground level, the offices’ landscaped terraces clearly evoke cliff faces or natural slopes. The future 200 West Caribbean Drive will be 505,000 square feet, while the nearby 100 West Caribbean Drive will be slightly larger at 538,000square feet. Other than BIG, Clive Wilkinson Architects has been tapped to design the interiors, while OLIN Landscape Architects will be responsible for the landscape design. A project this large will require a number of approvals from the Sunnyvale city government, and the project is only just beginning to work its way through the process. 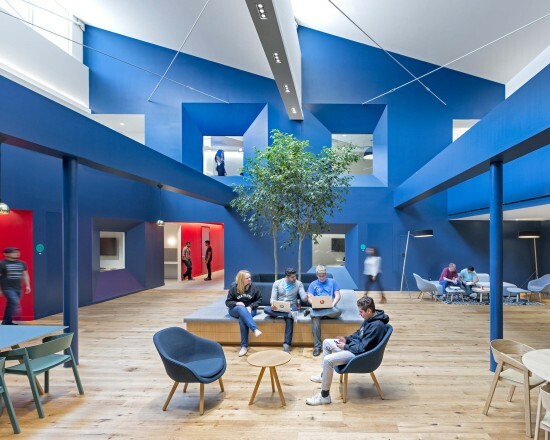 Google expects to move employees into the finished buildings in 2021. Of note is that the city has mandated that all of the utilities, sewage systems, hydrants and streetlights will need to be relocated and upgraded, which will falls under the city of Sunnyvale’s design guidelines. 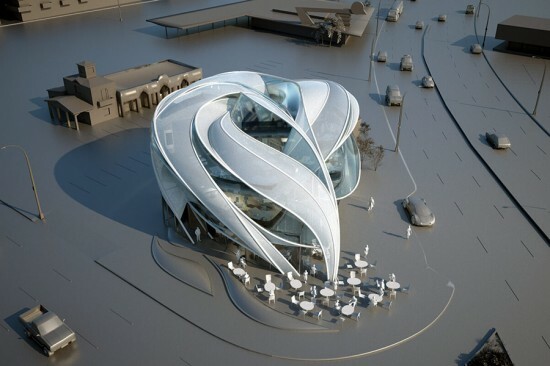 In the lead up to the holidays, public radio listeners in Southern California couldn’t help but tune in for some architecture news as KCRW DJs plugged the capital campaign for their new building designed by Clive Wilkinson Architects. The firm was awarded the Santa Monica commission in 2008, beating out Gensler, HLW, Morphosis, and CO Architects in the competition. The three-story, 35,000-square-foot KCRW Media Center has a price tag of $48 million with extra funding needed to fit out the studios and offices of public radio station and NPR affiliate. https://youtu.be/60SjsjwZn78 As part of Santa Monica College’s expanded Media and Technology campus, the new building replaces KCRW’s cramped basement office with state-of-the-art studios and performance spaces, including the 18,000-square foot Wallis Annenberg Plaza Courtyard and Outdoor Stage and a 180-capacity auditorium for community events. Santa Monica College’s new entertainment and technology campus will also include new teaching facilities, TV and production studios, and a new parking garage. KCRW staff is scheduled to move into the new building later in 2016. In the meantime, check out the construction time lapse. 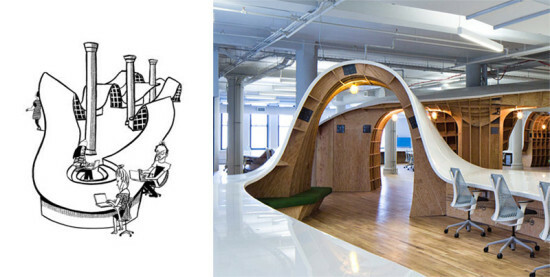 Building of the Day #10 The Barbarian Group 112 West 20th Street Clive Wilkinson Architects It seems like something out of an interiors sci-fi novel: a barbaric desk comes to life, invading a helpless office floor. Nothing can stop it. It grows around structural columns. 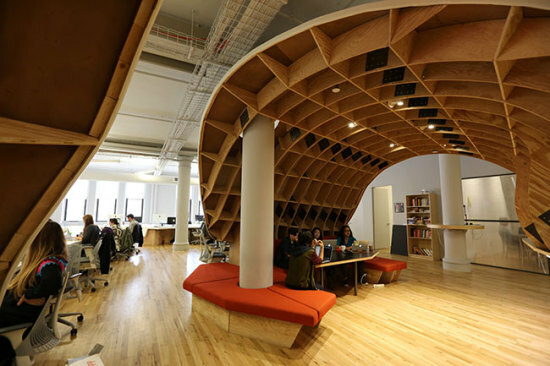 Monsters represent our cultural fears, and this could be a story expressing our anxieties about Corporate America, if it wasn’t for the fact that Clive Wilkinson Architects’ superdesk for The Barbarian Group is so functional and so cool. A 1,100-foot-long uninterrupted white surface snakes about the office, arching to create nooks for informal meetings and casual encounters. During today’s tour, Clive Wilkinson and Barbarian’s Genevieve Robles and Nick Bonadies took us back to the origins of the superdesk. 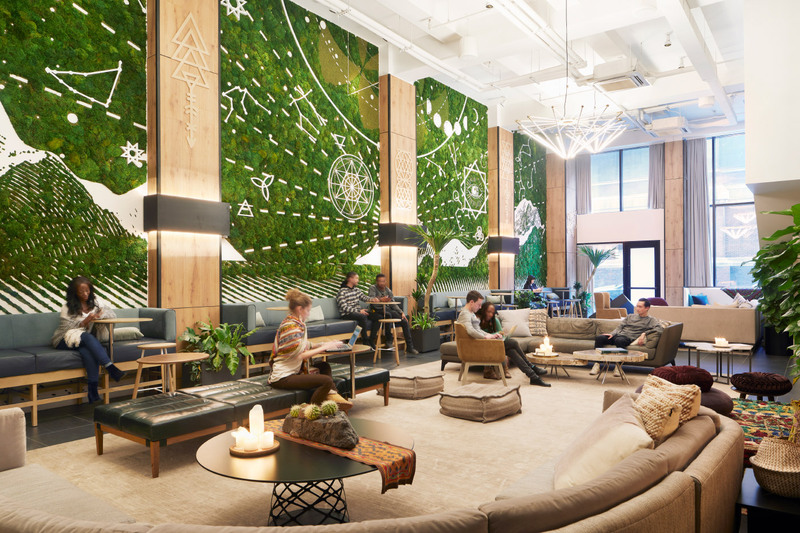 While The Barbarian Group was still working in cubicles, it challenged Wilkinson andhis team to design the most creative, collaborative environment possible. His solution was surprisingly simple: sit everyone, from the founders to the interns, around one enormous desk. All of the pieces were fabricated in LA by repurposed automotive robots driven by floppy disks, and then trucked across country. After weathering winter snowstorms, the pieces finally arrived in New York, all small enough to fit in the office building’s modestly-sized elevator. The desk was assembled on-site, and after a 30-hour eco-resin pour just a few days before staff moved in, the desk became the seamless surface that has graced many an architecture publication. 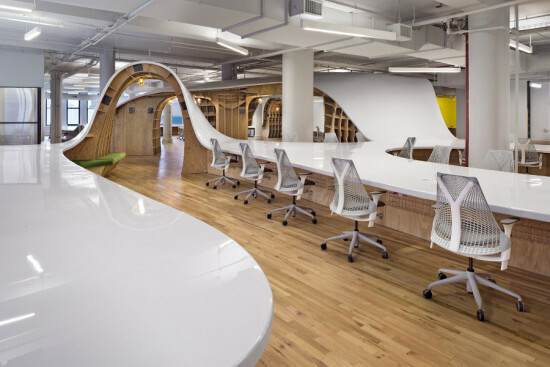 Despite the epic creation story, Wilkinson said that the superdesk is around 40 percent less expensive than designing a traditional office space. The surface’s undulating form creates subtle divisions, allowing employees to gather by departments. However, desk spaces aren’t fixed, and staffers can easily roll their under-desk cabinets to another location if a project requires them to do so. “We can restack the deck whenever we need to,” said Robles. Wilkinson chose to expose the nuts and bolts, but the sparkling, seamless surface still looks astonishingly malleable. At one point it dips down, forming what Robles referred to as a “waterless hot tub.” Elsewhere, the surface softly rises to standing height for employees who prefer to work on their feet. 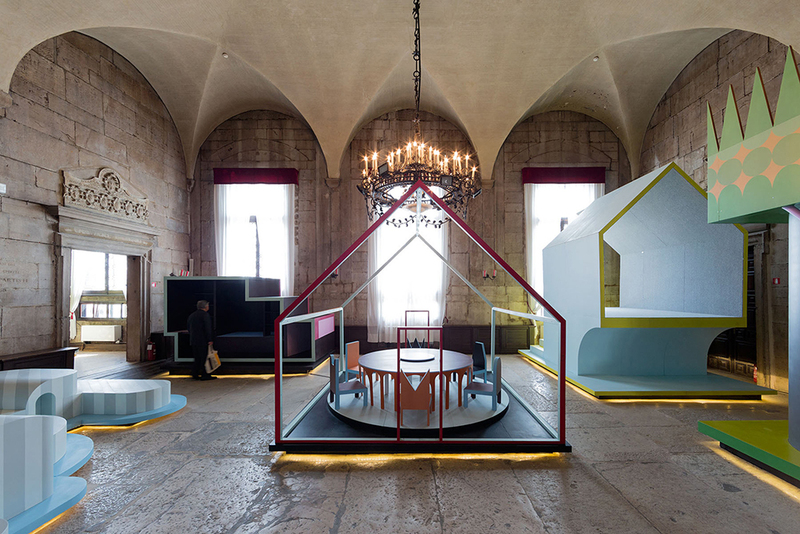 And comfortable furniture grows almost organically inside the arches, which are padded with sound insulation to create intimate meeting environments. Wilkinson’s expressive surface can make imaginations run wild. And this is exactly what The Barbarian Group was looking for. Don't forget your library card for tomorrow's tour at the Glen Oaks Branch Library! Yesterday Santa Monica radio station KCRW broke ground on its new hub, which will bring it out of a basement at Santa Monica College and into the architectural spotlight. The 35,000 square foot building, designed by Clive Wilkinson Architects, will be located on the college's future Entertainment and Technology Campus, in the city's creative business district, along the Expo line. Wilkinson won the commission back in 2008, but the bold, colorful design has developed significantly since then. KCRW, which started out three decades ago, has grown from 14 to 110 employees, so it was definitely time to move out of their cramped underground offices. The new facilities, with plentiful access to natural light, will offer high tech production facilities, community gathering spaces, and top tier office spaces, as well as an 18,000 square foot courtyard and outdoor stage and a 180-seat auditorium. 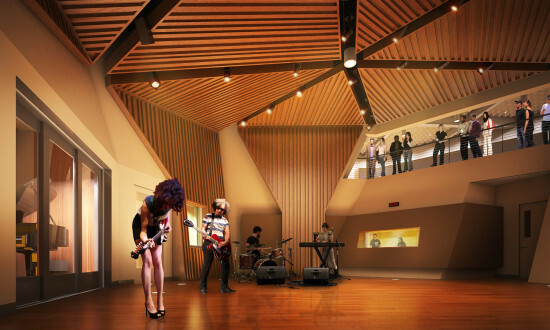 Radio performances will be open to the public, making the station even more of a community and musical center. KCRW has so far raised $33 million of the total $48 million for the new campus. Construction is expected to be done by the end of 2015, with the station moving in by 2016. 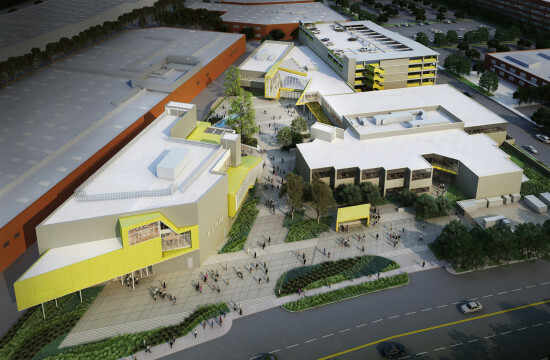 Santa Monica College's new entertainment and technology campus will also include new teaching facilities, TV and production studios, and a new parking garage. Never Built: Los Angeles A+D Architecture and Design Museum 6032 Wilshire Boulevard, Los Angeles July 27–September 29th, 2013 It is difficult to envision the city of Los Angeles any differently than it exists today, but AN West editor Sam Lubell and co-curator Greg Goldin, in collaboration with Clive Wilkinson Architects, have organized an exhibition at the Architecture and Design Museum that grants visitors the rare opportunity to get a glimpse of the city as it could have been. The team gathered a diverse assortment of renderings, models, and various media depicting parks, buildings, master plans, and transportation schemes that were designed with the intention of being built, but were deemed too novel to actually be brought to life. The collection features unrealized projects, such as Frank Lloyd Wright’s 1925 Civic Center Plan, William H. Evans’s 1939 design for the Tower of Civilization, and B+U Architect’s 2009 design for an office building on Firestone Boulevard, as well as many other projects that, had they been carried out, would have completely changed the physical reality of the city of Los Angeles.